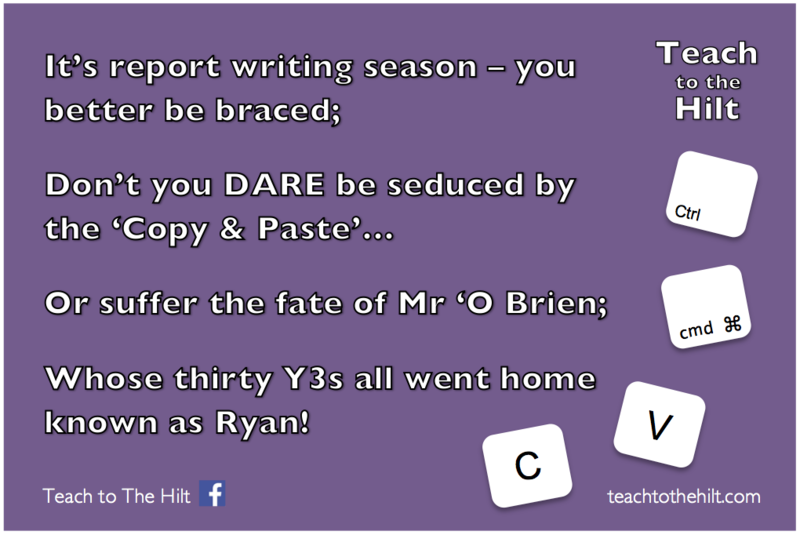 Whose 30 Y3s all went home known as Ryan! Until after a month, his smile slipped away. A sickening feeling I’m sure you’d agree? And signed off on reports for a week with a click. But was too trigger-happy with copy and paste! Poor Ted – he had blown it – he’d messed up the lot! All the kids were called Ryan, both the twins, Jane and Scott. OB was hacullinating and two stone lighter! The first parent came in and she started to shout. So it’s perfectly plausible he ended up Ryan. And by 3:35 it was all over Twitter! Or be heckled when shopping like Mr OB.